The painting above is from a memory of a scene that I have been painting over and over again. 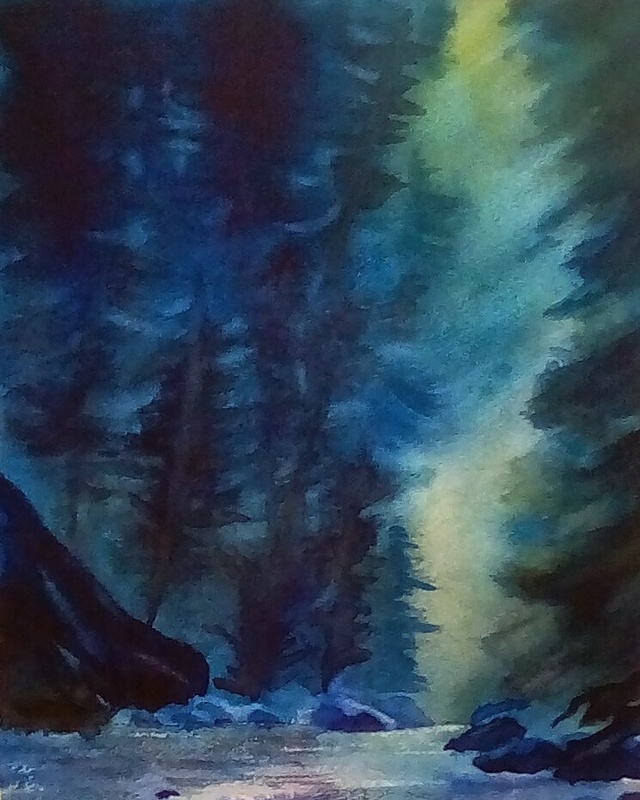 It is actually at the North Yuba river but you wouldn’t know it by the way I simplify and abstract the elements. I will be taking a short hiatus from painting while I am doggie sitting my Granddog. We have many plans for hiking, playing, watching tv, catching up with my reading, making new doggie friends. I am thinking about taking my art supplies but it might be too much of a hassle to take my watercolor equipment. I might do some research and take art books to study, we’ll see. I am undecided about this one, it is difficult to make sense of the rapids in this photo but in reality it is far better. I think that there is conflict about the focal area. But I do like the mood, let’s end on a positive note, right? Another one, I did these in quick succession, hoping to thrust me into some imaginary land, creative muse on the mark, get set go mood. Oh I wished that I could marry up the photo to my actual painting, I am very hard critic with my paintings but this one is beaming bright in my heart! This one I have yet to make some sense of various areas. I lost distinction of the river, I’ll work with it to get it to come alive. I have no idea what this will be, who knows? I am not worried, I might get a sky or a landscape or both by the time I am finished with it. I wanted to include it just because I wanted to stress a point that sometimes a painting can be one that evolves over time. I might let it sit for a while and work on it once I get back to my studio. Or, I might turn it over and paint on the other side. Until next Saturday, Happy Painting!! Painting Out of My Mind! I am so impatient today with this post, I am not satisfied with my photos, neither on my phone or via my camera. No matter what I did, I just can’t seem to marry up my photo to my paintings!! Sigh…. I wasn’t sure if this one would work and I kept at it until I found my way in, sometimes you have to muck through to get to the gold. I almost gave up on this one, I am receiving high praise for it on Instagram, I am on the fence. Though I do like the feeling of serenity. I kept at this until I had my “feeling” I wished that this photo shows the inner light, very transcendental. I was not able to tone down the yellow at the top, not as vivid in reality. This one was so fun to paint. For some reason my inner artist seems to try for this scene over and over. Perhaps someday I’ll figure out why. Of all the paintings that I am not happy with the photo, it is this one. The yellow is really a raw sienna, not this yellow, the blues are too vivid, in reality the overall colors are all grayed. The over-all softness is not apparent in this photo, sigh, one last time. I would have discussed more about my techniques but truthfully I am getting impatient and want to get to painting. If you have any questions, ask away. Until next time! I have been enjoying more warmth in my paintings lately. I am a lover of blue but want to reach out towards a little heat. This particular scene is in Colusa County on a day trip with my big brother Doug. I am working more and more from my imagination and memory rather than photos. Easy for me now that I am willing to let loose and not rely on relentless detail. I don’t think that I’ll ever tire of this scene. I am intrigued by the light and the overall feeling. One of my favorite scenes on my favorite paper. I didn’t plan on that golden pyramid shape in the background, it “snuck” in but I would like to think that it is a sunlit mountain, let the imagination work. 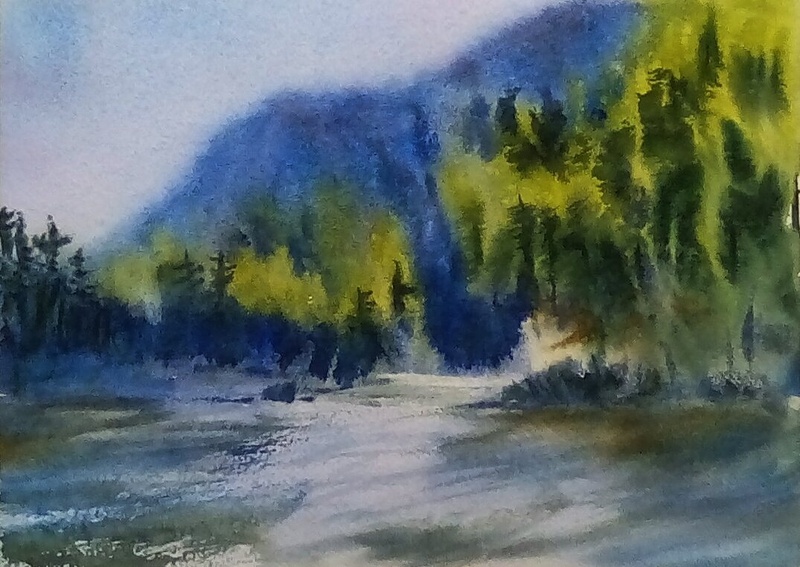 Basically the technique with these imagined landscapes is working wet on wet and building a scene intuitively. I love abstracts and when I paint them I work entirely by intuition. I had the most difficult time getting the colors to match up with my painting. I do believe that my photo on Instagram is much better. I don’t have as much time this week to paint because I will be running into town twice this week. I have to pick up a painting from my framer that I won via ArtistNetwork. It is an original painting by Thomas Schaller, one of my favorite watercolorists. Talk about exciting to have won something, a first time for me. Happy painting folks! I lost some blues in this which made this painting richer and the sky/sun is not as acid yellow, keep that in mind. I am rather happy using my computer lately for uploading photos and writing these posts. This week has been pretty busy with painting, the above painting started out as intuitive though I had a directional left pull and I had to take a little time to resolve it. It might still have that pull but I do believe that the rays of light streaming down counteracts that. The purple lavender on the bottom is more of a grayed purple, keep that in mind. This one reminds me of a sand storm. I love granulating colors and it was perfect for this scene. I was very pleased that I was able to get the photo to marry up with the actual painting, I lost some of the rich color when I posted it to Instagram. It reminds me of something out in space. I am really enjoying minimalism. I start with swiping on color, wet on wet use my sprayer, letting the colors mingle and blend. I turn it around and around and look for a scene. Most times it makes itself evident from the get go, I have been pretty lucky so far in that I find it so quickly. I only paint what I intuitively know what to do. If I don’t feel moved or am unsure of what to do next, I set it aside. I prefer to paint loosely and nowadays imaginary scenes but I do like to return to a more realistic scene to hone my skills. 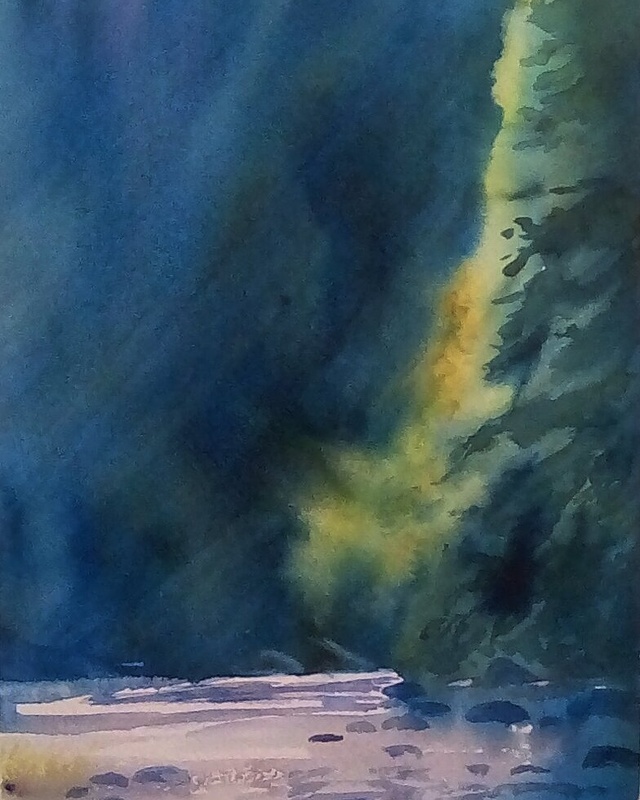 I had gone up to the North Yuba river about two weeks ago to plein air paint. This painting was from one of my photos. I use the photo as a jumping off point, I use artistic license, which is more fun. I was feeling a bit off the day I started this, I basically threw myself in a fury of painting hoping that I get out of my perfectionist funk. If anything, this is a creativity killer for me, being picky about how my paintings look. Woah, hold onto your socks! I love painting imaginary scenes but this one I am loving it but also scratching my head. I wanted to paint outside the box and really up my colors but boy, did I go wild! The sky/sun in this photo is not as acidic in reality and the blues are more of a Prussian blue which leans towards a blue/green. I wanted to go wild and minimalistic. More of an exercise, I think that Debi Riley’s last couple of posts inspired me. I wanted to add one more painting, sorry for the length of this post. The blues pop out more than they should, it was difficult to marry up the photo to the painting, the painting is very rich and deep with contrasting color. Well, that’s in for now, keep painting happy! I tried my best to match up the photo but at least the pixels aren’t messed up, too much, I think, yay! I think that I got the photo to marry up well with my painting except that the “sun” is way better than what it shows in the photo. While my grandson entertained himself with drawing dinosaurs, I took the opportunity to get some painting done and this is what I came up with. No idea what I was going to paint other than the chosen colors. I love painting this way, no preconceived idea, and no expectation, just going with the flow of the paint and picking out an imaginary scene. 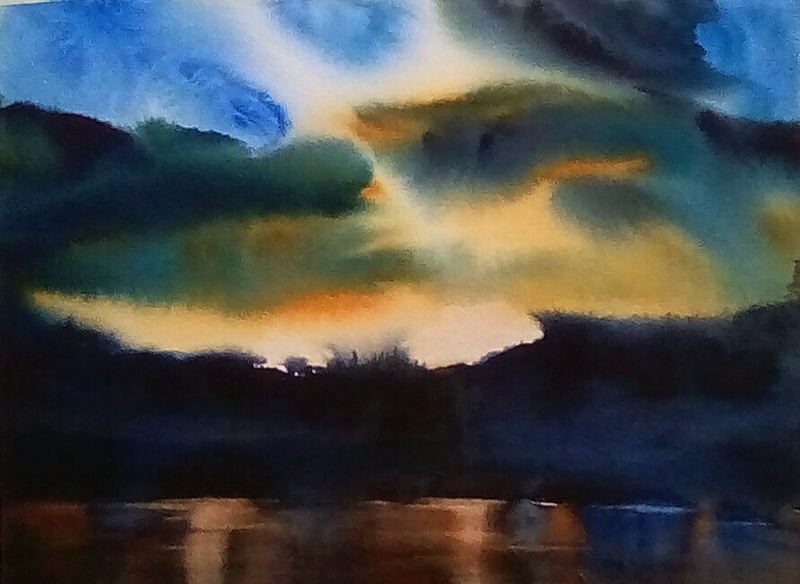 This is an semi-abstract of a scene of Lake Francis that I have painted several times. I started out the typical way and that is usually throwing on some colors and looking for a scene. This was painted saturated wet on wet. If you haven’t tried this technique I suggest that you give it a chance. It might seem different and out of control but that is the whole point, right? 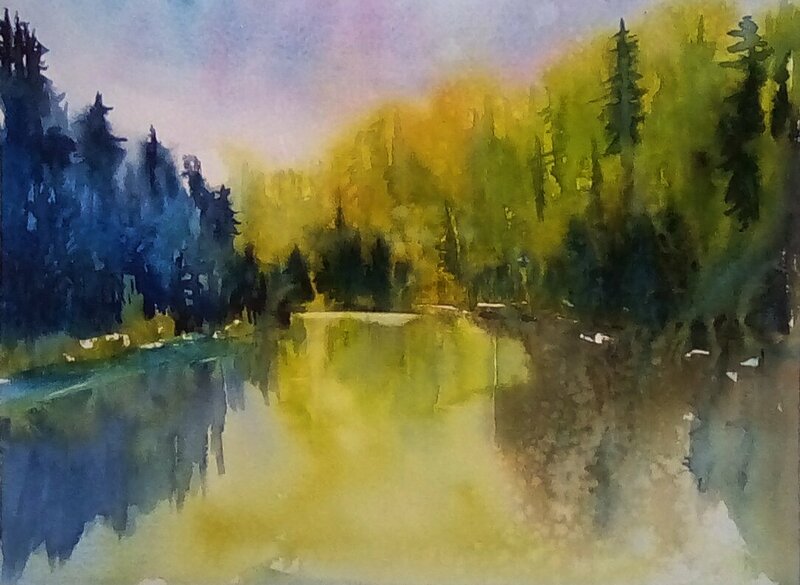 At least that is the way I like to paint with watercolor. Be aware that while the paper is saturated, the whites are very easy to pick out but once the paper is dry, it is near to impossible to regain white without scraping the paper with a blade. As long as the paper is wet, wipe out to your hearts’ content. This is a scene that I have painted the most so far in the past year. In fact I wonder if I have already posted this one but I am pretty sure I haven’t. I had a difficult time to get the light yellow to show up as light as it appears here, keep that in mind. Another painting that I had a difficult time getting the photo just right but you get the idea. This started out as a plein air and I finished it up in the studio. I am finding out that what worked for me in the past in regards to painting en plein air isn’t working for me any longer. I just can’t sit and paint, I need to stand, I do this at home and I often step away to take a “look see”. I am considering getting an easel but it has to be very light weight because my neck and back can’t take lugging in heavy equipment any longer. So, while I painted this, I used a big flat rock as my table and I also painted wet on wet and very loose, just like I would at home. I am trying to carry my attitude and painting style to the field. These were painted on small square pieces of leftover paper and purely from my imagination/memory. I think that I had Lake Francis on my mind when I painted these. I wasn’t too sure if this was successful or not, I haven’t shared it on my Instagram just because of the uncertainty. I love the feeling of it but for some reason I don’t like at the photo of it, there is something lost in translation. No idea. That is it for now. I have a few more paintings to share but until next time, count your blessings! One last photo from my plein air painting trip the other day, enjoy! I have been painting up a storm lately and enjoying every bit of it. The weather has changed drastically in the last few days, my husband had gone up to the Sierra Buttes and there was about 4 inches of snow! I hope to get up there soon to paint. Painted saturated wet on wet. If you haven’t tried this technique you have to give it a try, it is absolutely thrilling. There is approximately a two hour window of painting time without having to wait for any layers to dry. It takes a bit to get used to the mushy appearance as you work it but to me it is like sculpting rather than painting. Once it is dry, you go back in to punch up your darks. What a joy to paint this, I had no idea how it would turn out and I loved that fact, I prefer working this way. 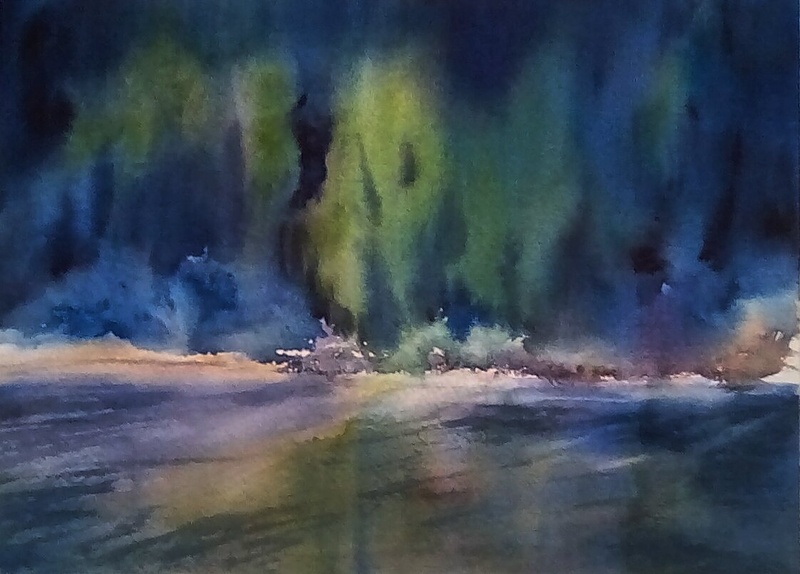 Again another intuitive painting, I loved playing with the light. The glow in the middle section is not quite as bright in reality in this photo, keep that in mind. I loved painting this, imagine that! This painting wasn’t turning out as I imagined so I decided to abstract it to play around with shapes and values, nothing lost in an exercise of this nature. I have three more paintings to share, until next time! I have been painting and also getting ready for fall and winter. I have been feeling a desire to get out there to paint en plein air with the weather changes. The painting above is wild and colorful but I wanted to get out of my usual routine. I like to stretch myself to see what happens. Another painting testing my colors and being loose, not sure if it works but that is alright. This one was painted entirely by intuition, my favorite way to paint. This is that same scene that I have painted over and over. This was based on a photo that I took of a reservoir near me. I wanted to go dramatic and here we are. I wanted to paint serenity but wanted to have a little more interest in the water, I added a little more detail for dimension. I might give this another try it two.